You’ve heard it before: When developing a content marketing strategy, you must start by determining what you want your content to accomplish. Though creating high-quality, compelling content is a tremendously significant part of the content marketing process, it’s even more important that your content proves to be effective — nothing else matters if your content doesn’t help you achieve a business goal. Often, traffic alone is not a great indicator of content marketing success, but coupled with other metrics it can be particularly insightful. For example, your home page is probably one of the most visited pages on your site — but this isn’t always due to the content found there. If you’re employing basic SEO and promotion strategies correctly (and they are functioning properly), chances are your home page will always be one of your most visited pages, regardless of how useful the content you publish there is to your visitors. Tip: In order to use traffic volume to measure content marketing success, compare pages of similar content to each other, as all pages are not created equal. Lets look at an example: The graph below shows a huge spike in overall traffic to my company’s site, which occurred during the week of March 1. Data like this should prompt a website owner to take a deeper dive into Google Analytics data to determine the cause, which is exactly what we did. In this instance, we determined that the traffic spike could mainly be attributed to one of our blog posts that was shared on a popular Facebook page. As you can see in the screenshot below, a company with a very active community shared the post, which prompted many “likes,” comments and shares. All of this activity contributed to a high volume of traffic. 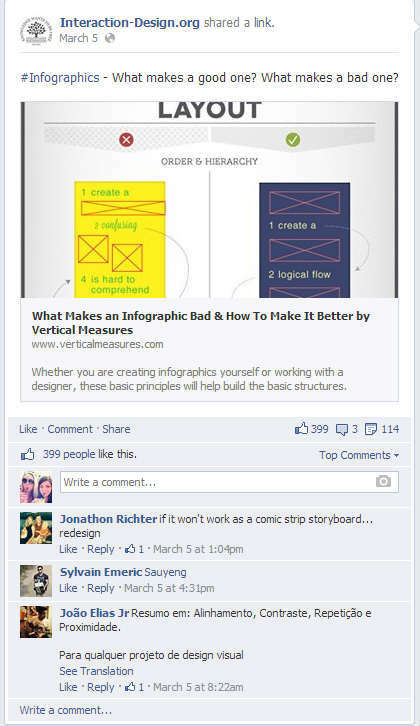 Because of this post, other Facebook users and pages shared the link with their audiences as well. As a result, this post still garners a few visits a day, despite it being published months ago. A blog post or web page with a high volume of page views can likely be considered a strong content page, as it is obviously drawing a good amount of interest from your audience. But another metric to consider on high-traffic pages is the time on page. When the average time on a particular page is much higher than your site-wide average, it suggests that this page is grabbing and keeping visitors’ attention more than other pages, indicating that the content there is worth analyzing more deeply, to see what additional insights it might provide. As you can see from the image below, the average time on page for our infographic post was nearly twice that of our site-wide average at the time, which told us that audiences were interested in the content we published on that page, and gave us a benchmark for comparisons to other content we plan to publish on our blog as part of our content marketing strategy. Referral traffic shows visits to your website or page that originally came from an outside source. For example, if a visitor clicks a link on a social media site like Facebook or Twitter that leads to your website, that visit is considered a referral, since the social media site referred the visitor to your site. Measuring referral traffic in Google Analytics can be done in many different ways. One way is through the referral traffic report (under “acquisition”). A second is by choosing “referral path” or “full referrer” from the list of secondary dimensions. You most likely have a content promotion and/or distribution strategy in place to get your content in front of your audience — for example, you may be sharing your content on social media sites, promoting it through email marketing and submitting the links to bookmarking sites. (If your content is valuable, your audience will share, email, and bookmark your content on their own accord, as well.) As sharing increases, your promotional efforts will likely result in an uptick in referral traffic. This referral traffic can be a testament to the effectiveness of your promotion and distribution efforts by providing insights on which sites are referring the most traffic and the timing of the traffic being referred. 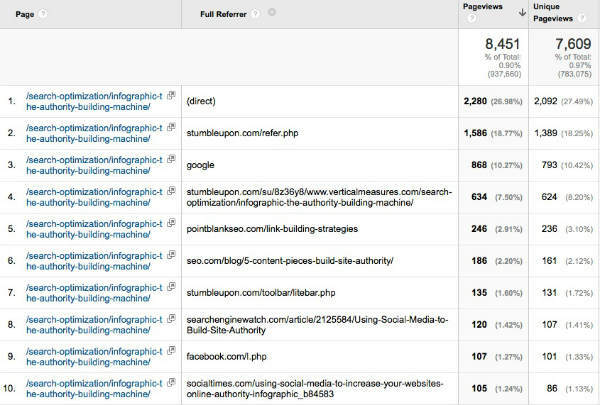 For example, the screenshot below shows referral traffic to an infographic from a “full referrer” secondary dimension report gathered from Google Analytics. The infographic has received 8,451 page views (7,609 unique page views), with referral traffic from a variety of sources. As you can see in the Full Referrer column, the infographic received many visits as a result of being shared on Facebook and StumbleUpon, as well as from the blogs that linked to it. Because of this, the website owner may consider submitting similar content to StumbleUpon and comparable bookmarking sites to get its future content efforts in front of those same engaged audiences. A common practice in content marketing is to create downloadable content for audiences. More often than not, the downloadable piece is kept behind a gated link — meaning visitors must fill out a contact form in order to gain access to the content. However, sometimes visitors are able to download content without providing any additional information. In those instances, it is necessary to set up “event tracking” in Google Analytics to capture the incidence of your content being downloaded. Once you have event tracking set up, you can establish an event goal to track downloaded content conversion rate. When setting up your event goal in Google Analytics, you must set conditions for your goal and specify a category, action, label, and value. You also must assign a value to the goal — either the value you provided when originally setting up the event, or another value of your choosing. In the case of measuring downloads, the event will be the act of downloading the piece of content. After your event goal is set up, you will be able to find the number of people who are actually downloading your content, without requiring any additional contact information from your visitors in your prefer. This data can be used in conjunction with other metrics (like page views and time on page) to measure the success of your content offers. Consider this example: A piece of content was downloaded 5,438 times, as measured by event tracking. Additionally, a goal was set up to register when that event (someone downloading the content) took place. A total of 16,719 visitors, 15,243 unique visitors and 5,434 downloads were captured. Evaluate the conversion rate by measuring it against conversion rates of similar content pieces. In an instance like this where the content isn’t gated, conversion rate is especially telling, as there is no risk associated with downloading the content piece. Overall, there are several ways to measure the performance of content marketing strategies through Google Analytics. As you may expect from a tool used by more than 10 million websites, the amount of data available in Google Analytics is vast, and much of it can be used to prove ROI. From traffic and time on page to referral traffic and number of downloads, much of the data needed to measure against a range of possible content marketing goals is available in Google Analytics. 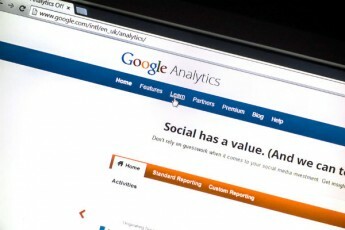 How are you using Google Analytics to measure content marketing success? I’d love to hear from you. Want more insight from experts like Arnie Kuenn on how to manage today’s biggest content marketing challenges? Sign up for our Content Marketing Institute Online Training and Certification program. Access over 35 courses, created by experts from Google, Mashable, SAP, and more.